Ailsa’s travel theme for this week (Where’s my backpack?) is BRIDGES. This is a theme that I love to talk about. As a bridge designer and subsequently project manager for quite a few highway, railway and pedestrian / cycle track bridges from mid 1970s to mid 1980s; I have a special interest in bridges of all sorts. I have been keeping track of bridges of different historical ages, single span to multiple spans, short (just a single plank) to very long ones (suspension or cable stayed bridges), with stone and masonry as construction materials to wrought iron, steel, reinforced / prestressed concrete to even structural plastics, from straight to curve, from old style designs to the more modern bridges of streamlined aerodynamic designs. These are all my fields of interest. Let’s start our journey from Scotland, UK. 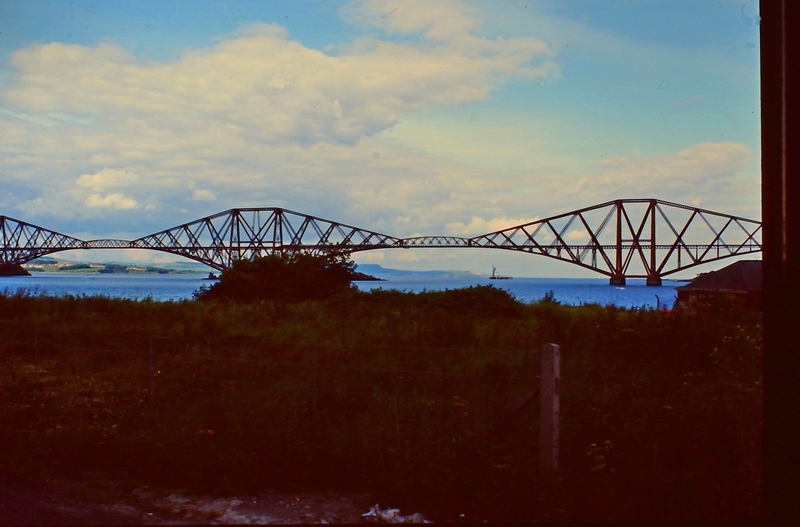 The Firth of Forth bridge is the first steel bridge built in the UK. It was opened on 4 March 1890, and spans a total length of 2,528 metres. The photo was taken in 1985. 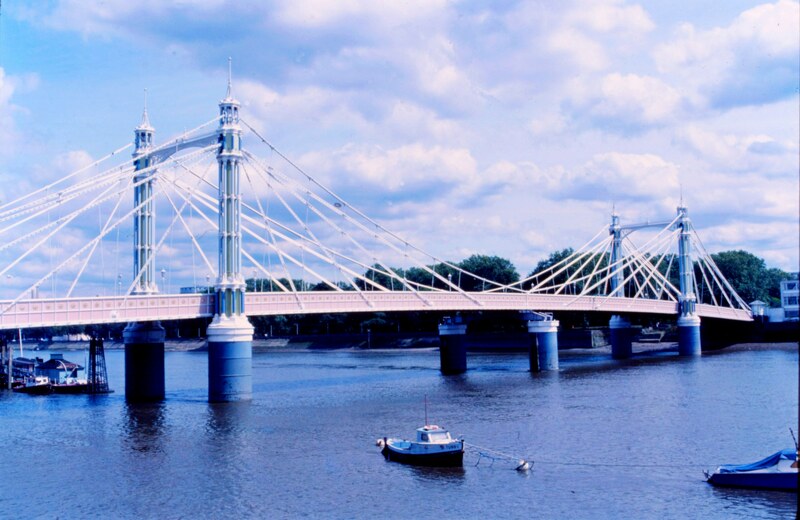 Going south into London, we have a view of the Albert Bridge which crosses over the River Thames in West London in West London, connecting Chelsea on the north bank to Battersea. The bridge was designed and built in 1873 as a modified cable stayed bridge. Again, the photo was taken in 1985. It is always a delight to stroll the river banks of River Thames, viewing bridges – including some of the notable bridges: the Tower Bridge and the Millenium Bridge..
We then crossed over the Channel to the European continent and ended up at Riga, Latvia. 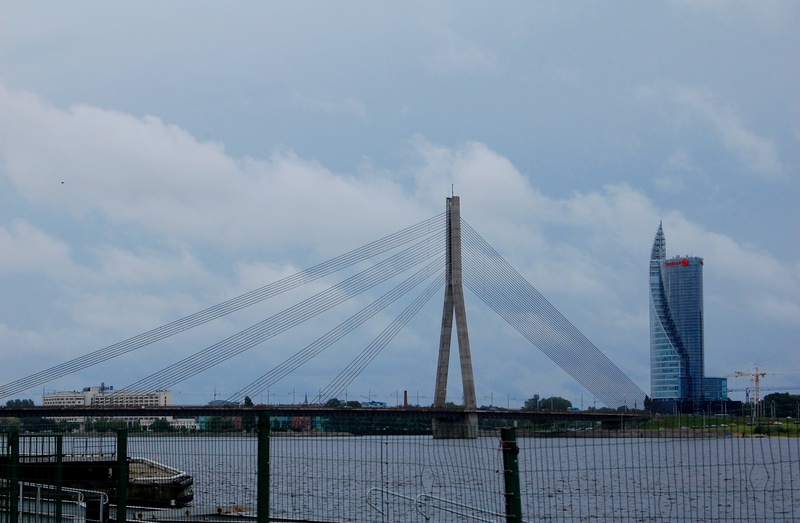 The Vanšu Bridge in Riga is a cable-stayed bridge that crosses the Daugava river with a length of 595 meters. In the background is the TV tower. 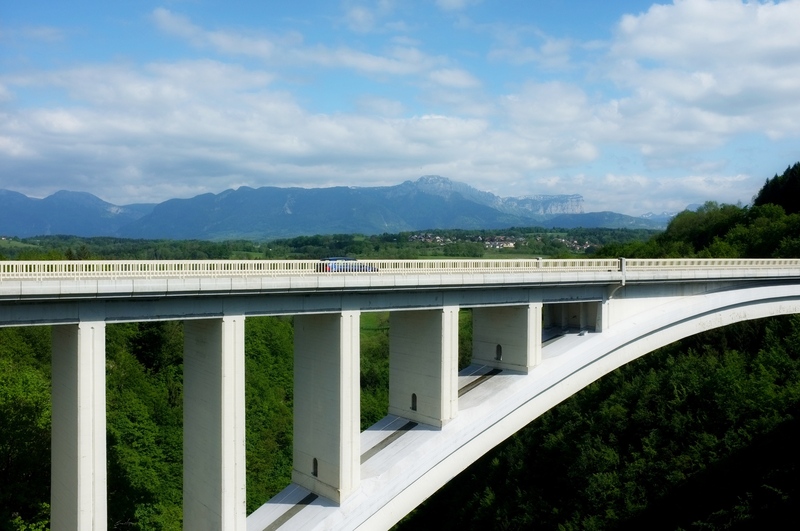 Further on, we passed through Switzerland where we saw a reinforced concrete arch bridge with clean strong vertical supports springing from the curved arches. We digressed into Budapest and have a great view of the bridges crossing this stretch of the River Danube. Our attention was immediately drawn to the Chain Bridge. 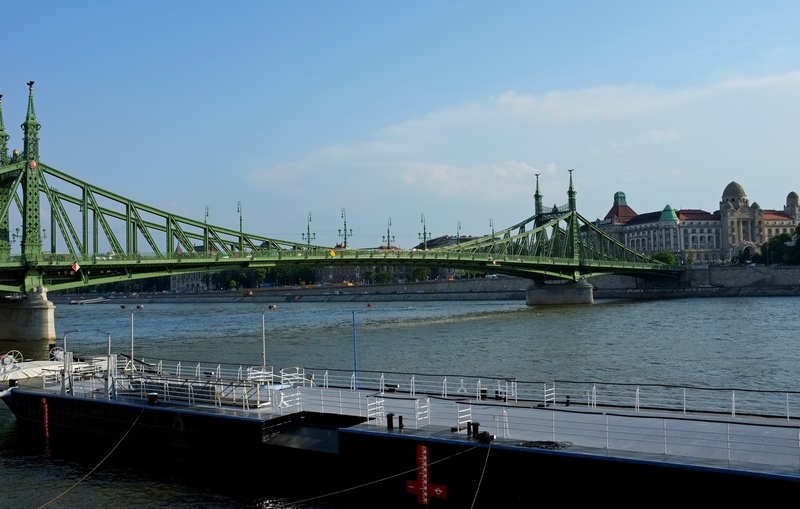 This bridge was the first permanent stone-bridge connecting Pest and Buda, and only the second permanent crossing on the whole length of the river Danube. It is one of the iconic structure of Budapest, the most widely known bridge of the Hungarian capital. Walking further on along the river bank, we reached the Liberty Bridge. 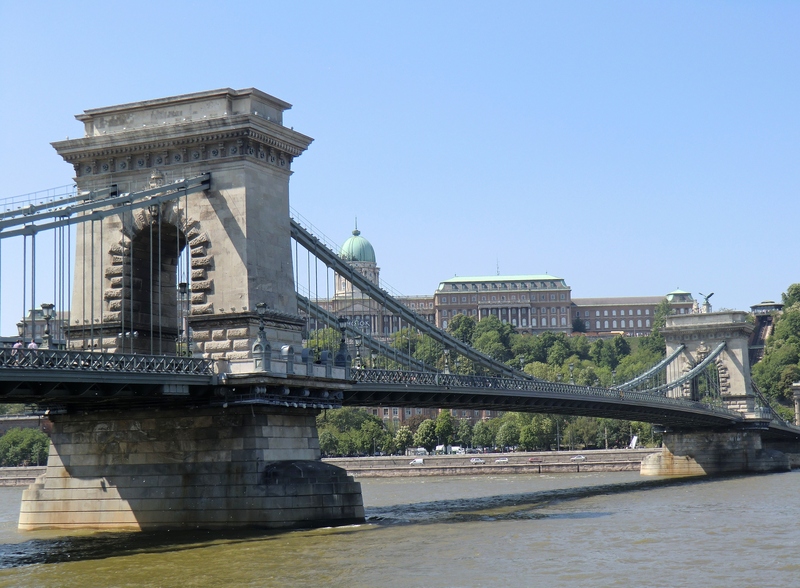 It is the third and shortest bridge of Budapest. It was built for the Millennium World Exhibition in 1896, its original name being Francis Joseph Bridge. There is another bridge in the vicinity known as the Elizabeth bridge.Elizabeth Bridge was named after Queen Elizabeth, the spouse of Francis Joseph I assassinated in Geneva in 1898. 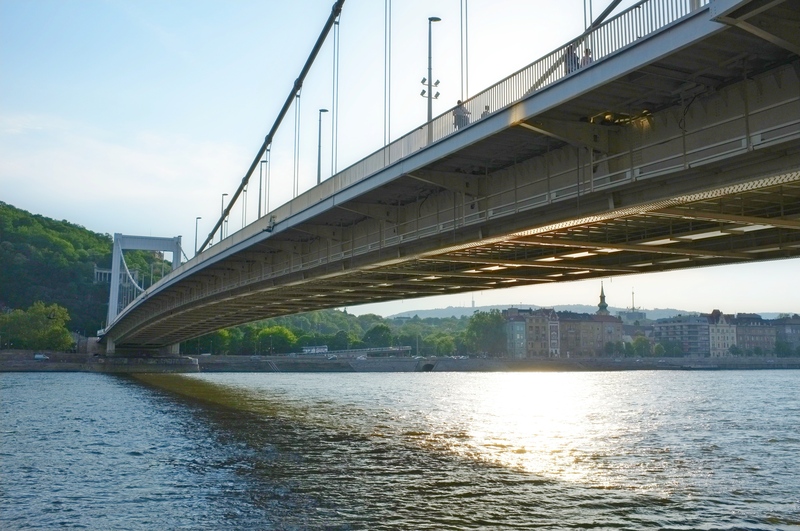 With only one 290-meter span stretching over the Danube, the original bridge built in eclectic style was known as the longest suspension bridge of the world. 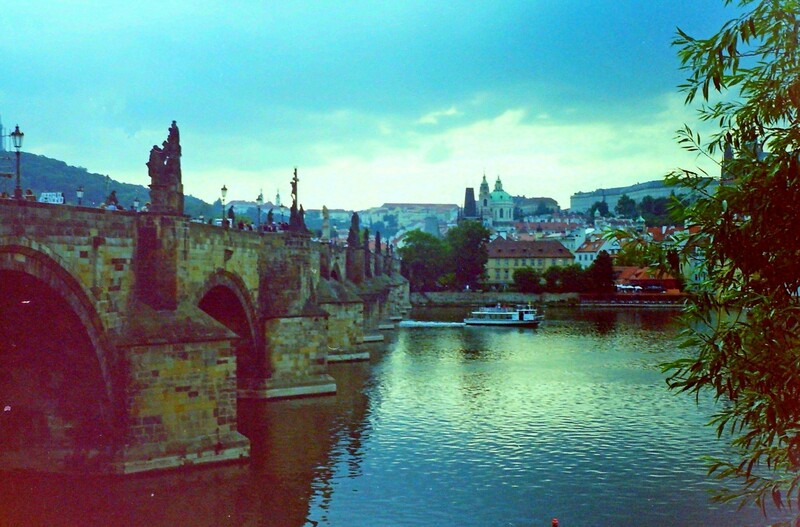 No mention of bridges will be complete without mentioning Charles Bridge in Prague. For many hours, I have been walking up and down the bridge, viewing the statues on both sides of the bridge and admiring the beautiful scenery. 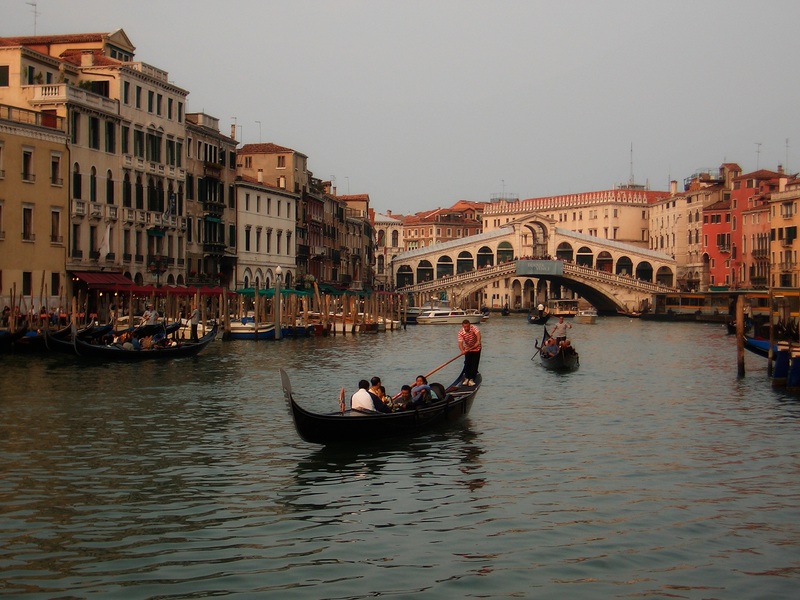 We finally ended up in Venice, Italy and was totally charmed by the well-known bridge which appears on many photos. 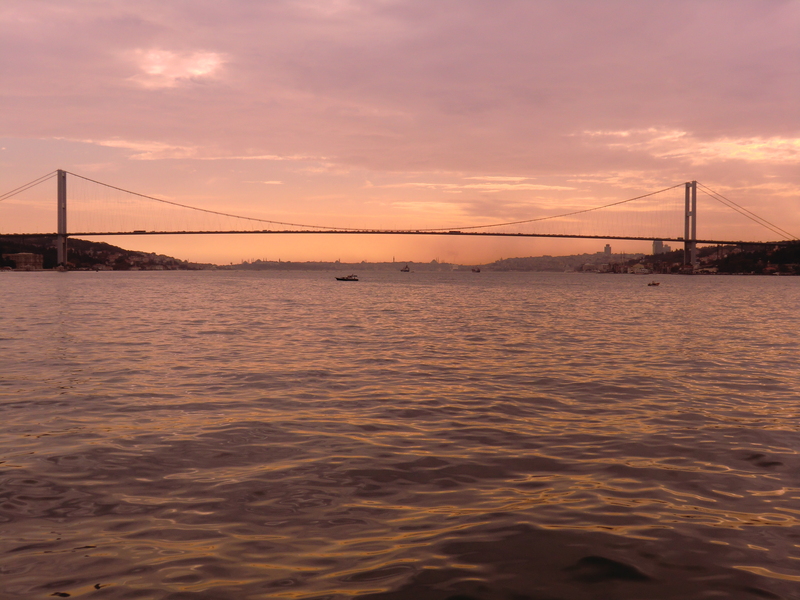 We then flew to Istanbul, Turkey and embarked on a cruise up the Bosphorus from where we had a breathtaking view of the suspension bridge which connects Europe to Asia. It is a gravity anchored suspension bridge with steel towers and inclined hangers. The aerodynamic deck hangs on zigzag steel cables. 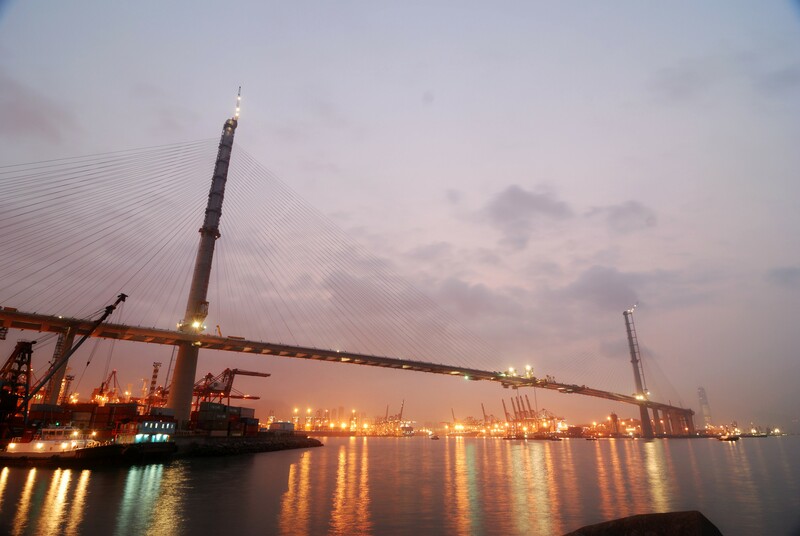 It is 1,560 m long with a deck width of 33.4 m.
From there, we took a plane to Hong Kong where at that time, the longest single span cable-stayed bridge was being constructed. The picture taken from the shore shows the construction was extended into night-time to take maximum advantage of the time slot outside the typhoon season. 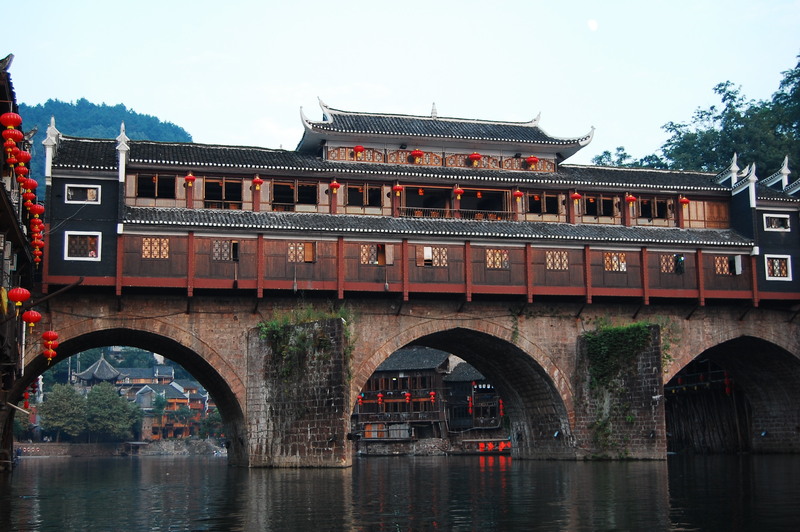 Then we headed north and ended up at FengHuang city, China where we were overwhelmed at the sight of this ancient multi-arched masonry bridge across the river. We made our way to the Three Gorges, cruising up the Yangtze river, we passed by many bridges. One of these is a cable-stayed bridge of new construction. 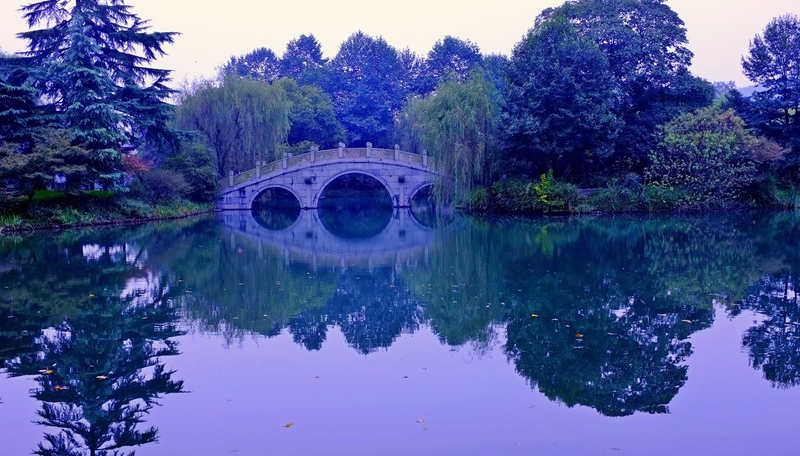 We thought we have seen enough of modern bridges and, for a change, we decided to visit West Lake, China and viewed some of the old stone arch bridges in their serene surroundings which sent tranquility into our minds and souls. As if we were not tired of travelling, we flew over 16 hours and landed at New York City. 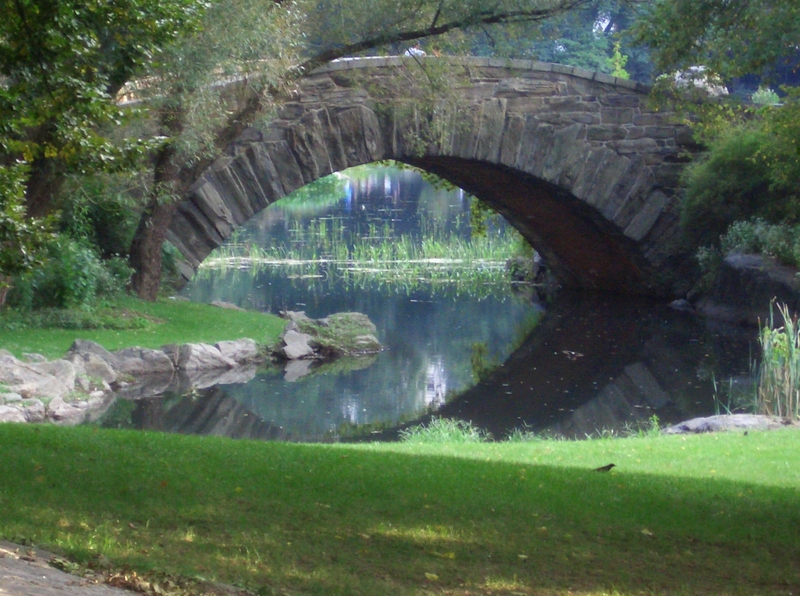 One of the bridges we like to visit is a stone arch bridge in Central Park. Is this the bridge shown in Richard Gere’s movie of “Autumn in New York” ? We didn’t quite know but was greatly impressed by the romantic setting. We went on to see other bridges like the Brooklyn bridge and was awed by its beauty. On our way back, we decided we would not do a non-stop flight to HK but stop at San Francisco. How could one miss the Golden Gate bridge? We make a tour of the area and saw the mist rolling in under the bridge. What a sight! Bridges are aesthetically pleasing and are symbols of connection and overcoming obstacles. I love bridges for these reasons and these are the reasons for posting them. The above trip is, of course, based on a fictitious journey undertaken by the Retiree. In fact, it has been undertaken over different time zones, space, at different time, during different life stages of this retiree. 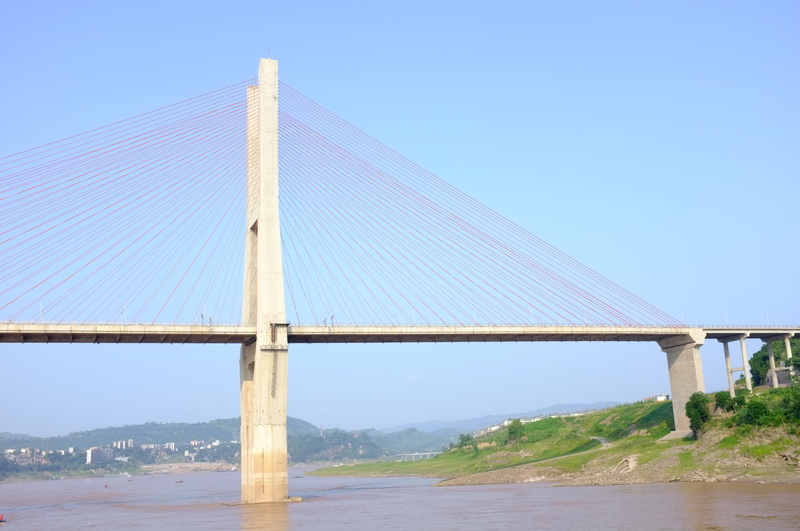 It has been pieced together so that readers can have a global view of bridges all over the world – as a reminiscence of the retiree’s interest in his early career! Michael, very informative post and great images to illustrate! Thanx for sharing! What a cultural lesson and a creative theme also. if i remember correctly the longest wooden bridge in the world is in japan! Well done. Please post more and tell us about different types of construction and load bearing etc. What great and interesting photos, MIchael. I especially love the one of the Elizabeth Bridge. Beautiful shots! I love bridges and these are great. Interesting to look at these pictures from the perspective of someone who loves bridges. I wonder if there’s a different feel to pictures that are posted for a theme, and those that you took because you were passionate about the subject matter. You’ve covered almost all the styles there Michael! My 14 year old son loved your pictures and post. He finds bridges and architecture to be really interesting. What a great range of pictures! 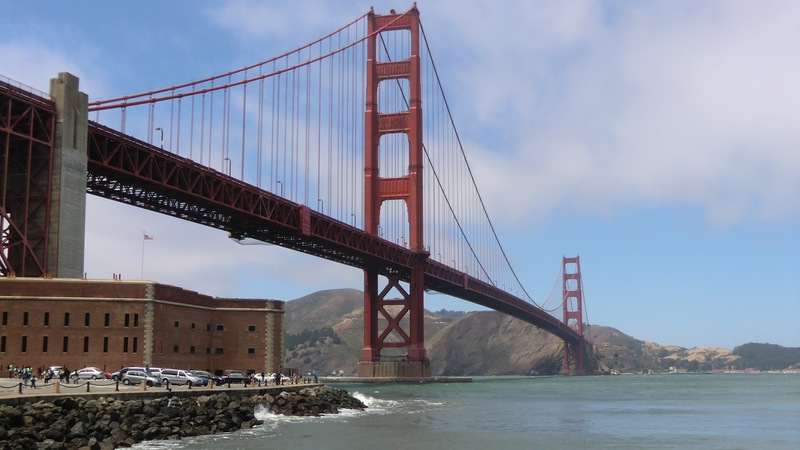 Thanks for the wonderful travelogue of bridges! Wow – so many beautiful bridges! My favorite is the one from Venice. When I was there it was rainy so I did not get any good pictures – this one is wonderful! Thanks for sharing your whirlwind worldwide mini-tour of bridges. There is such incredible diversity and beauty in the images of the bridges, which we may often think of as merely functional pieces of architecture, used to get from one point to another. Thanks for the charming and informative look at bridges. Just fantastic…love the variety, the colors, the textures, I love your photos. Thank you again bulldog for your continued support and kind comment! I really share your reasons for liking bridges, and your illustrations make the post so much fun to read. Great post! Bridge designer? What a great job! You’ve missed out my favourite – the Humber Bridge in Hull, UK, which was the longest single span suspension bridge in the world for most of the ’80s and ’90s. I’m a civil engineer and also love bridges. Brooklyn Bridge is my favorite but Japan has some extraordinary works of art as well. Great post. Wonderful bridge post and photos. The next time you are in NYC take a look at the Triboro and Hellgate Bridges. They are beautiful and terrific to photograph. Happy travels to you. Thank you so much. Fascinating! I the HK bridge the Ching-Ma Bridge? How I wished it was on the course of the HK Chater Half Marathon, but they only included it in the Full Marathon. Otherwise, I would have already flown to HK to walk on it. It seems this theme was just perfect for you. Lovely, I enjoyed looking through this. Yes, I would have liked to write something about my love for bridges. This theme is just ideal! Budapest has some awesome bridges. This is a fantastic.. gallery – some bridges you have crossed and been under. My favorite here must be the little one in Central Park. Modern bridges are beautiful. But, those aged Chinese bridges are elegant and telling stories. Great photos! Wow, we must have stood in the same spot in Central Park. I thought I was looking at my own photo! Haha! When you have some time, you should google “High Level Bridge” in Lethbridge, Alberta…largest of it’s kind in the world – I will be featuring a future post of this on my blog. Once again you managed to amaze me with beautiful photos. I enjoyed immensely watching them since I am also very fond of bridges. In case you ever come to this part of Europe again, make sure you visit Belgrade as well. We are very proud of our new bridge on the Sava ( here’s the link to some beautiful photos of it – http://youtu.be/4bvGjdMYsLI). That was fascinating. I really enjoyed your photos and the information about all the different types of bridges. How beautiful was that story, albeit fictional, and the photos…amazing! Thanks a lot for sharing. We will cross that bridge when we come to it… Have a great day! Nice theme, and great pictures! I remember the Three Gorges project as being very controversial. My mom was a bridge designer also, and I didn’t come to appreciate what crucial work this was – as well as the aesthetics of it – until more recently. Wow, what a wonderful post. I didn’t realize it until I read your post, but I must have a fascination with bridges too, because I have quite a few photos of them and truly do love going to see them. Large or small, I always ask my husband to stop the car and let me get out to take a photo. However, the only ones in your post that I have seen personally are the ones in Venice, the Bosphorus, and New York (Central Park) – all the others were new to me. Until I reached the end of your post, I did not realize it was a fictional trip! It is very interesting to learn you have designed bridges. I have an unusual photo that features two bridges in one place; I will have to use it in an upcoming post. Thanks for a lovely tour. Awesome photos! Maybe my favorite theme of your posts so far. You were able to capture such beautiful moments of these bridges! I love bridges. To me, they’re one of the finest places where architecture really meets art. They lend themselves to the ornamental. That is an impressive collection and a really cool way to tie many trips together. Interesting work that would’ve been for you. I marvel at how concrete stays up there with what seems like little support…honestly, I don’t get it at all. LOL. I enjoy new construction for the boundary’s it challenges and conquers but I love the simple old stone bridges, most suitable for foot traffic because that’s the best way to take in the scenery. In a car with traffic whizzing by, it’s easy to miss all the beauty, even in bridges. Thanks for the tour Michael. An interesting and informative article. Keep up the good work! Wow! Thank you for sharing your travels and adventures. I am also fascinated by bridges. Every bridge has its own story to tell. God Bless! Beautiful post Michael with lovely pictures. Thanks. Specatacular entries for the challenge. Bridges are works of art. It would be difficult to select just one. You never disappoint in your postings for these challenges. Thank you for being such a great photographer. You are someone who I aspire to be as good as. Hi Isadora, thank you for your kind and encouraging comment 🙂 Hope to upload more good stuff! Need to learn from you to have such a good archive system so you could find all these photos for illustration in this post! Bridges are such works of art and your photos are great! Thanks for visiting my blog and all the best to you. Beautifully written… and filled with images to match. Hi, I also like your comparison of the two bridges, side by side. Looking forward to be inspired! Imagine having traveled enough to be able to display so many wonderful well shot images of your memories on a topic so specific. While the rest of imagine you span more of the world. May your feet always have wings. Hello. I also have a keen interest in ancient and even modern bridges. I highly recommend reading a book I reviewed on my WordPress blog which covers the long history of London Bridge. In my book Robinson and Crawford County (pub. by Arcadia Publishing.com) I did a double page spread on a magnificent bridge which spanned the Wabash River. It was a steel toll bridge which connected Indiana to southern Illinois and was the fifth of six self-supporting bridges to be built in the western hemisphere. The main builder was also responsible for building the 1,000 Island Bridge across the Great Lakes. This is magnificent! Not only because I have two little boys who are interested in all things construction… bridges really are a powerful image for connecting – and as is obvious above, make beautiful images, especially when put together like this! I really enjoyed this virtual journey, and was pleasantly surprised at how many I’ve seen, too. thank you for finding my b,of, so I could find yours! Nice article re’ bridges – these are great fun and I have a ton of paintings and sketches of bridges from all over the world – a bit of a fascination for me too. Managed a project once sketching all the bridges over the River tay in scotland – there are lots! Prague took my breath away. Beautiful, I love the theme! Great post, and the photos are wonderful. thanks for dropping by my blog Michael. I just loved your bridges one! Venice in colour Michael is truly beautiful and on my bucket list. but instead oof that, this is wonderful blog. Michael, I shared your blog posts on bridges on my Pinterest. It is somewhat like a ‘Reblog’ but not on Word Press. Your photos are so beautiful that I thought others would enjoy them. I did say that these photos were your property. If this is not O.K. with you, let me know and I will remove your posts. Thank you! Thanks for posting the link to this wonderful collection of photos! A great post Michael. Love the Charles bridge. I can wander up and down the bridge from before sun rise to sunset!